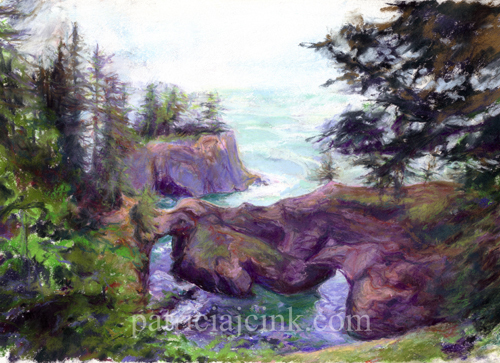 This soft pastel painting was done from a photo taken at the Samuel H. Boardman State Scenic Corridor. It is a park that runs along the Oregon coast between Highway 101 and the Pacific Ocean near Brookings. There are hiking trails that connect the scenic viewpoints as well as small parking areas near some of the viewpoints. This amazing little cove is one of the treasures in the park. It would be fun to do a series of these natural bridges at in various lighting, times of day and levels of tide.